Accessorize your ears in peace with these peace symbol ear buds! 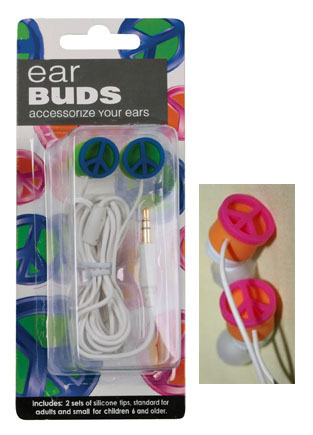 These peace ear buds work with any iPod, MP3 player, PDA, Portable gaming system or laptop computer. Each pack includes two sets of soft silicone tips, standard for adults and small for children. Available in either orange and pink or blue and green, these peace ear buds great way to get peace visible out there as you move around!